Location: Vic-sur-Cére, in the Puy-de-Dôme departement of France (Auvergne Region). Notes: Castelsoutro de Vic (low castle) Vic is an ancient castle built along the National Road 122 in the town of Vic-sur-Cère in the Cantal. Oblong main building of two storeys square under roof, incorporating the South which was perhaps an ancient tower now partially buried; the eastern part has been modernized in the mid-nineteenth century. Polygonal tower staircase of the sixteenth century the center of the garden facade. 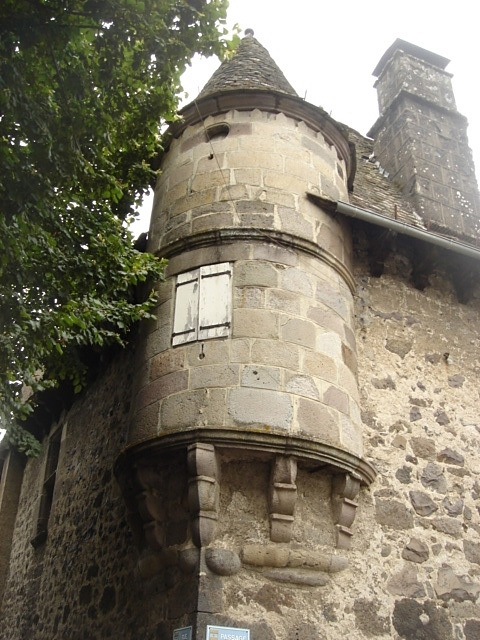 At the southwest corner, similar to those of Comblat watchtower is carried cantilevered over a row of five crows molded three-quarter round behind. On its north side, modern buildings are attached. Cover slate with a skylight in the nineteenth century. Not open to visitors.